Revised and improved, but still very much a product of the base car’s DNA, the new IS-F is a spectacular machine. The heart of the car is still the all-aluminium V8 engine, engineered specifically for consistent high performance driving. The unit seems to bulge out of the hood and churns out a neck-jarring 417 bhp with an electronically limited top end of 170MPH. As a result, this four door is capable of getting to 60 MPH in under five seconds, with in-gear acceleration to quicken the pulse. The throaty V8 is kept in check by an eight-speed Sport Direct Shift automatic transmission, which is smooth and swift between up-shifts. Down shifts are given a bit of electronic assistance as the transmission blips the throttle to match engine speed, enabling even the rookie amongst us to compose a competently polished symphony. 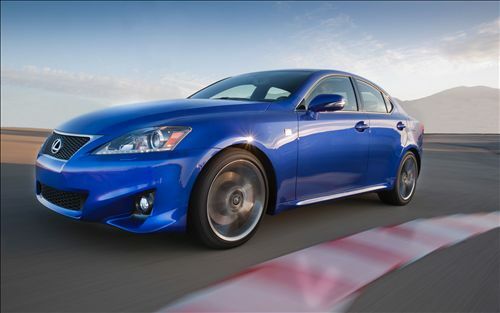 To coincide with the already updated performance profile, Lexus engineers lowered the center of gravity of the chassis by an inch compared to the standard IS, to not only improve curb appeal but handle proficiency as well. A chunky bodykit enhances the look, with a deep front bumper extending outwards to give the car a forceful head-on stance, and a larger radiator grille and lower colling ducts. The IS-F’s most distinguished feature, its Roman nose, has been slightly whittled away in comparison to its predecessor. It still houses a vast protruding V8, giving the hood an endearingly aquiline characteristic. Hefty 19-inch forged alloy wheels are accommodated within wide wheel arches both front and rear, while side vents in the wings channel heat from the engine and accentuate the cars wedge-shape profile. Finally, there’s a subtle but aerodynamically efficient spoiler blended into the boot lid, aiding air flow in conjunction with out-of-sight under-body elements. Inside the cabin the tried and tested Lexus design language is displayed in carbon fiber, perforated leather and aluminium varied finishes. Rear space is also more than acceptable, making the IS-F all things to all people. The brainchild of Lexus engineers Yaguchi & Sakanoto, they initially wanted to develop a high performance saloon that would antagonise the BMW M3 and Audi RS4. Four years after the IS-F’s inception they have achieved their aim, and unlike the competition, we are delighted it did.